My initial reaction was similar to MARK R. MAGILL’s, there must be more to this program that I am missing. When I realized the full extent of the program I failed to see any possible use for it! That being said, it would be an ok program for a child/ teenager to use for a diary except for the fact that you cannot attach any pictures or other content to it! My first impression was that there must be some features missing, since I could not find a SAVE command and things like that. Then I realized: This program is exactly what is claims to be: a simple journal (think: electronic yellow legal pad) where you can jot down all your notes about what went on during the day without worrying about other people reading them. In that, it is perfect: Simple and easy to use, you pick up where you left off when you come back to it later. Pros and Cons: Simple to install, easy to use, and secure. Only “con” I could find is that it does not respond to the TAB key, which I’m used to using for indenting, but that’s just my habit and not a failing of the program. Summary: If you want a simple and easy to use place to keep track of what happened on a given date, I think you will like this little program a lot. This a major flaw in a potentially useful program. I agree the interface is unappealing but what do want in a diary? This software has a foreign author so do not expect it to look like it fell out of a Tron movie. Pen and paper used to be the tools used to take notes, reminders, and write down memories. With rapid increase in use of technology, PCs and smart devices became a part of our daily life. These devices allow us to do work, and a lot more that was not possible without them. So many users now prefer taking notes and reminders on these devices. There are many third party applications available for this purpose. 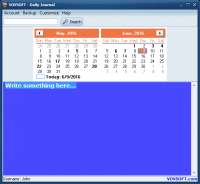 Daily Journal is a simple application that allows you to write memories, notes, and save important appointments on your PC. The user account of the application can be locked down with a password, so that all your important and personal data is safe and secure. The installer size is ~4MB, and the installation process is simple and straightforward, taking no time at all to complete. When launching the application for the first time, it asks you to activated the application. It can be activated and registered with the license code you have. Once done, you can then use the application to ‘Create a new user’, or to ‘Login’ to the existing user account. Creating a user account is easy, you have to enter username, password, and a recovery email. After creating the account the application automatically logs in, and you can start using all that this application has to offer. The UI of the application is clean and straightforward, designed to be easy to use and understand by all types of users, even the novices. At the top is the menu bar with usual drop down menus. Under it is a calendar that can be used to navigate between entries, followed by the area where you can write you notes, important stuff, and even memories. There is a built-in search function can make it even easier to find different entries. You can change font, background color, and theme of the UI. Moreover, you can print the stuff you write, and the application allows you to back up the data to import/export it. – Clean and Simple UI. – You can change the font as well as change text size and style. – Background color and theme of the UI can be changed too. – Calendar allows you to go back in time and check for the entries on a specific date. – It can create encrypted backups of all you important information, and allows you to easily restore it. – Search function allows you to quickly search for entries. – Create Multiple user accounts, and the data is secured in the application account with the password. 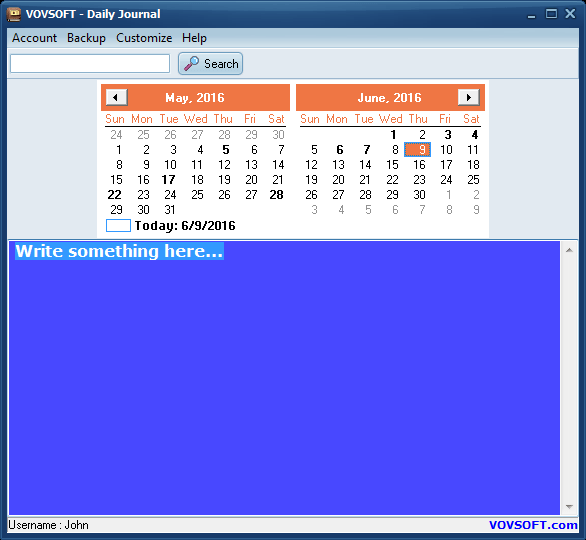 – The UI of the application looks outdated, it also does not allow you to collapse or hide the calendar. – Does not allow you to attach files to the notes, memories, or important information that you write. Daily Journal is a secure application, that lets you write down your thoughts, save important appointments and encrypt your data. It works smoothly, without any lag or error. It is definitely worth-trying. So ugly you’ll never want to use it. Makes your average Win 3.1 app look modern.